A vast number of studies has demonstrated causal relations between excessive elevation of the free intra neuronal calcium concentration ([Ca2+] i ) and neurodegeneration. Calcium-induced neurodegeneration is believed to occur in acute conditions such as nerve-transection induced Wallerian degeneration (Waller, 1850), mechanical brain trauma, brain ischemia, hypoglycemic coma and status epilepticus. 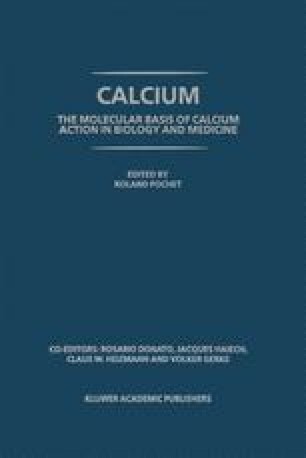 Calcium-induced neurodegeneration is also believed to participate in chronic conditions such as Alzheimer’s disease and aging. The degenerative effects of the elevated [Ca2+] i are thought to be mediated by the unbalanced activation of enzymes that take part in the normal neuronal function. These include proteinases, phospholipases, phosphatases and protein kinases. In turn, the unbalanced activation of these enzymes leads to cytoskeletal damage, membrane dysfunction, enhanced production of free radicals and, finally, neuronal degeneration (reviewed in Choi, 1994; Siesjo, 1994; Rothman and Olney, 1995; Kristian and Siesjo, 1998).